Composed by Jim Ferguson. Saddle-stitched, Style, Technique, Theory, Reference & Rhythm. Guitar Master Class. Jazz and Contemporary. Book/CD set. 32 pages. Mel Bay Publications, Inc #22130BCD. Published by Mel Bay Publications, Inc (MB.22130BCD). ISBN 9780786685868. 8.75 x 11.75 inches. 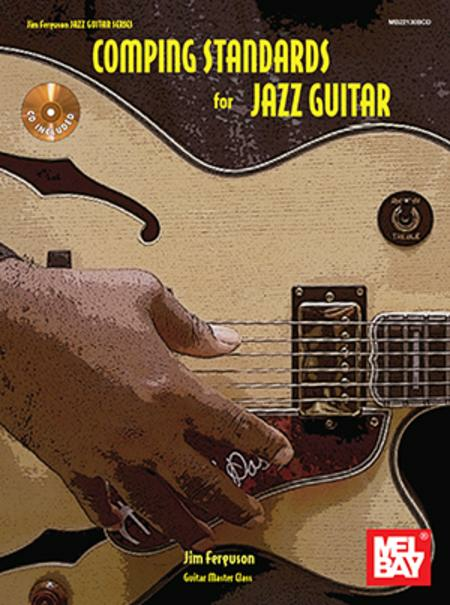 Jazz guitar guru Jim Ferguson-the author of the highly acclaimed All Blues For Jazz Guitar: Comping Styles, Chords & Grooves (MB96842BCD)-again helps you take your playing to the next level with Comping Standards For Jazz Guitar (MB22130BCD), his most recent offering. Using common jazz chord progressions, the book takes you through three primary comping approaches: straight-four, moving bass lines, and combo variants. In the process, you'll learn numerous chord voicings, ways to organize them, and a wide variety of dynamic rhythmic figures used in jazz. Other highlights include the use of guides and pivots, chord substitution, mastering rootless chords, playing with a pianist, inverting partial harmonic structures, Latin comping, chord scales, handling modal tunes, and mixing voicings. And the highly detailed music examples cover most of the common jazz keys. The material comes to life on the accompanying 17-track CD. In both standard notation and tablature.